The undeniable impact of the Hydroger project and its role in creating a difference in people’s lives is a story which has been shared with neighbouring states. Looking at the success of the existing project, other States felt encouraged to take up activities and projects are now operational in Arunachal Pradesh and Meghalaya. There is also a very strong interest expressed by both these states to setup additional Hydroger projects. Pongging is a small hamlet with 50 households situated right at the confluence of the rivers Yamne and Siang. Although it is situated quiet close to Passighat town (the headquarters of the East Siang district), there is no road connectivity to the main land. Village members have to trek for an hour and cross the Yamne River over a hanging bridge to get to the nearest road. As per Govt. records, Pongging is an electrified hamlet with electricity from the Ranganadi dam about 250 kms away. Although there are electrical lines and poles in the hamlet, electricity is intermittent and almost non-existent. Lawma & Visco and their technology partner NEPeD picked Pongging as an ideal location to showcase energy access using a clean technology- the pico hydro turbine. The turbine is currently being manufactured by NEPeD in Nagaland and can provide upto 3kw of energy- just enough to provide 2 light points, a plug point and some street lights to 50 households. 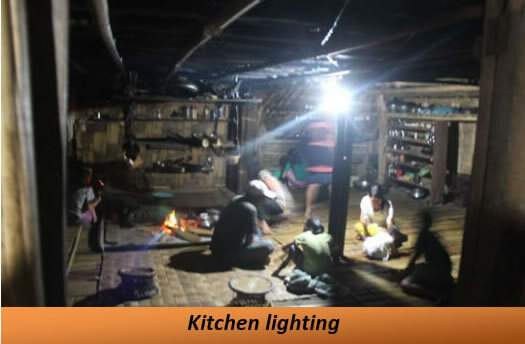 The community in Pongging was initially quite sceptical about the project but after seeing the advantages of having a captive energy source for their own utilization, are now extremely happy with it. It has instilled in them a sense of ownership, community integrity and productivity as obvious advantages of having lights in their homes.